Ayanna Pressley’s career has been marked by history-making campaigns and a relentless determination to advance a political agenda focused on women and girls and breaking cycles of poverty and violence. 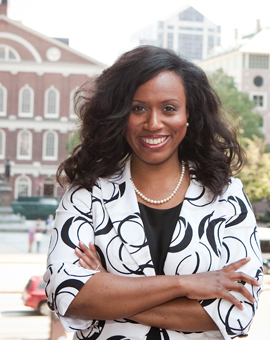 Ayanna was first elected to the Boston City Council on November 3, 2009, becoming the first woman of color ever elected to the Council. In her subsequent 2011 and 2013 reelection campaigns, Ayanna made history as the first person of color and the first woman in 30 years to top the ticket. During her time in office, Ayanna created and chairs the City Council’s Committee on Healthy Women, Families, and Communities. The Committee is devoted to the causes that she has always been most devoted to: stabilizing families and communities, reducing and preventing violence and trauma, combating poverty, and addressing issues that disproportionately impact women and girls. Ayanna is committed to working in partnership with community, building broad and diverse coalitions to advance policy reforms. She has earned local and national attention for her efforts to provide pathways to graduation for pregnant and parenting teens, ensure Boston high school students receive comprehensive sexual health education, diversify economic and wealth building opportunities for women and people of color, and strengthen support services for families of homicide victims and sexual assault survivors. 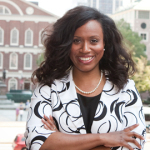 In 2013, she formed the Elevate Boston coalition to ensure issues uniquely impacting women and girls and the LGBTQ community were part of the 2013 Boston mayoral race debate. In 2015, Ayanna earned the EMIILY’s List Rising Star Award. In 2014, she was named to Boston Magazine’s Power of Ideas list, was a Greater Boston Chamber of Commerce Ten Outstanding Young Leaders honoree, and earned the Victim Rights Law Center’s Leadership Award. Ayanna is an Aspen-Rodel Fellow in Public Leadership (Class of 2012) and was selected as a Truman National Security Project Partner in 2012. Ayanna’s political career spans more than 18 years, in various behind-the-scene capacities at the federal level of government. She previously worked as a Senior Aide for Congressman Joseph P. Kennedy II and Senator John Kerry. Ayanna resides in Dorchester with her husband Conan Harris and her 6 year old stepdaughter Cora.